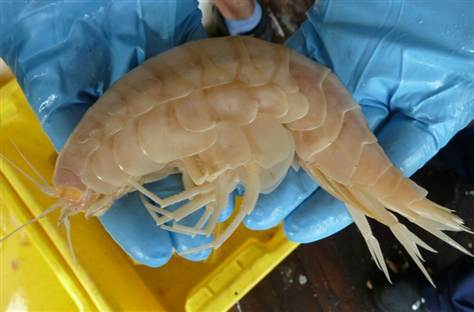 Scientists sampling a trench more than 4 miles deep were shocked when they pulled their traps in to find an elusive supergiant crustacean. The amphipods measuring 11 inches are more than 20 times larger than the typical amphipods. What we consider to be “normal” amphipods max out at about half an inch long. The trench being studied is off the coast of New Zealand which is one of the deepest trenches known. Seven of the supergiants were pulled up in the trap and another 9 were recorded by a camera located about a mile from the trap. There have been a small number of claimed sightings in the past. Scientist are unsure what brought the amphipods to this area and what is even more baffling is one week later the area was revisited and none could be found. If you ask me, these critters appear alien…. Pass the cocktail sauce please! 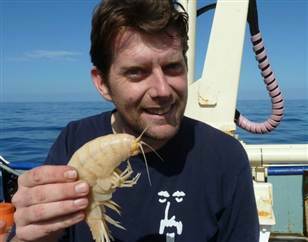 Scientist Alan Jamieson holds his unexpected find.